Successfully Added Android TV Box R99 - 4K Resolution, Hexa-Core CPU, 4GB RAM, Android 6.0, Google Play, Dual-Band WiFi, DLNA to your Shopping Cart. 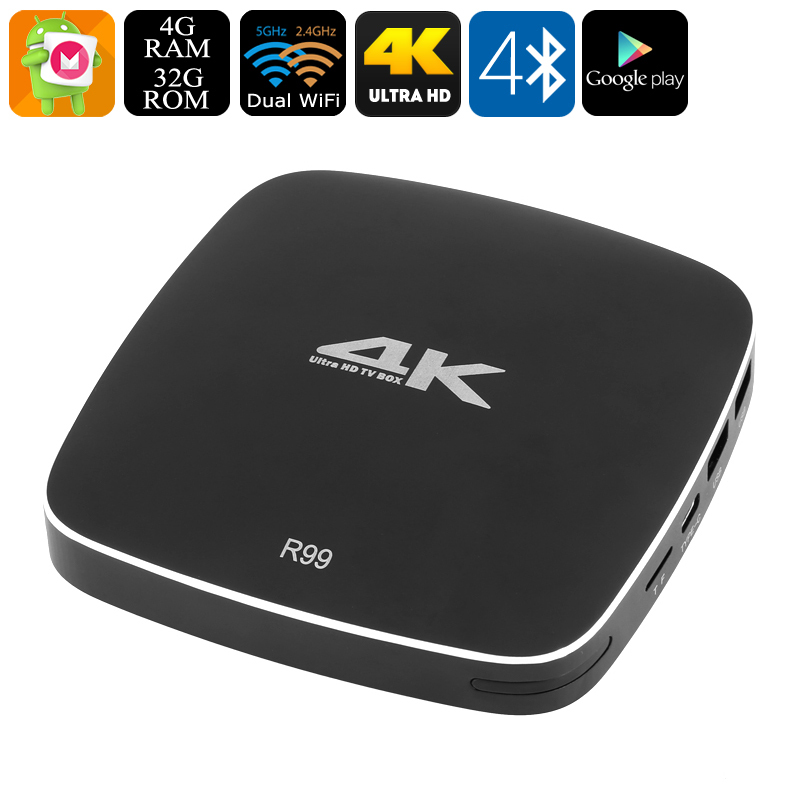 With its extremely powerful hardware, the R99 4K TV Box certainly is one of the crown pieces in the Android TV box industry. This absolutely stunning media player packs the Rockchip RK3399 processor which brings along ultimate power. As a Hexa-Core CPU that reaches clock speeds up to 2.0GHz, this processor delivers an outstanding performance that lets you enjoy the latest and most demanding media without dropping a frame. Along with its powerful CPU, this 4K TV Box packs 4GB of RAM – allowing you to engage in excessive multitasking sessions and never slowing down your device. No matter what you throw at this Android TV box – you are guaranteed to be treated with a stunning media experience. Thanks to its Android 6.0 operating system, it is not only the hardware that is top notch with this 4K TV box. Providing you with access to the latest software features, a smooth user experience is guaranteed when using this Android TV box. Supporting Google Play, you’ll be able to enjoy countless hours of online media and entertainment for free. Whether you like to watch a movie at home with your friends, or sit back and play some games with your children – this 4K TV box is sure to meet all your demands. Supporting 4K resolution, you can be assured that this Android TV box brings forth breathtaking visuals in high detail and crisp color. From now on you’ll be able to enjoy the latest movies, series, and live sports events on your 4K television set like never before – truly letting you take your media experience to the next level. Supporting 32GB of internal memory and coming with a 64GB SD card slot, this Android TV box supports all the space you need to store your games, movies, and applications. Dual-Band WiFi connectivity lets you browse the web at lightning speeds, making a laggy internet connection an annoyance of the past. Stream movies, play online games, or download files in the blink of an eye – nothing is too much for this powerful 4K Android TV box. Guaranteed to meet all your entertainment needs, with this Android 6.0 TV Box at your side, you’ll never have to feel bored again.